England’s juniors have won a bronze medal at the WSF World Junior Team Championships in New Zealand. An U19 team that included Lucy Turmel, Jasmine Hutton, Elise Lazarus and Alice Green was beaten in Friday’s semi-final against Malaysia but will not play a 3/4 play-off in Tauranga and will be awarded the third place prize. England  won all three of their Group C matches in the opening round of the team event, beating India, South Africa and France all 3-0 with the players dropping just two games. They emerged as group winners and entered a monrad draw for the top eight places, where they faced fifth seeds USA in the quarter final. Second string Elise Lazarus was first on to court, beating Grace Doyle 12/10, 11/4, 11/9 in 23 minutes to put England 1-0. 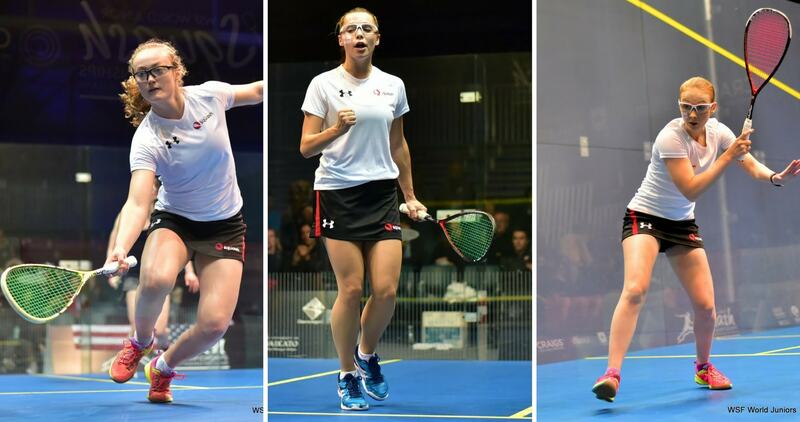 First string Lucy Turmel then took on Marina Stefanoni, who had knocked out Jasmine Hutton in the third round of the individual competition before, knowing a win would send England through to the semi-finals. But the American, just 14 years of age, fought back from 2-0 down to send the match to a decider, winning 8/11, 9/11, 11/8, 11/5, 11/3 in 48 minutes. Third string Jasmine Hutton then gave England the victory with an 11/6, 11/4, 11/3 win against Elle Ruggiero in 20 minutes. That set-up a semi-final against second seeds Malaysia and this time Hutton was first to play. Despite taking a 1-0 lead, she was pegged back 6/11, 12/10, 12/10, 11/6 by Aifa Azman. Sivasangari Subramaniam then beat Lucy Turmel 11/8, 11/8, 11/4 to send Malaysia into the final, where they will face Egypt. England were due to face Hong Kong  in the 3/4 play-off but the match will not go-ahead and England will be presented with a bronze medal as a result. England Squash’s Head Junior Coach Lee Drew said: “I’m very pleased with the way the players have rallied and come together this week. They have worked as a unit, been very professional and supported each other throughout. They gave their all against Malaysia but just came up short. No English player advanced further than the last 16 in the individual tournament prior to the event. The squad included Kyle Finch, Adam Corcoran and Tom Walsh in the boys’ event. Elsewhere, Team GB’s Fiona Moverley will take on eight-time world champion Nicol David, of Malaysia, for the bronze medal in the women’s singles event at the World Games in Poland. Follow her progress here.